From December 27-30, a group of 2018 USHJA Zone Team Championships Individual Medalists and select wild card recipients expanded their equestrian horizons by participating in the USHJA Gold Star Clinic-East Coast at the Jim Brandon Equestrian Center in West Palm Beach, Florida. 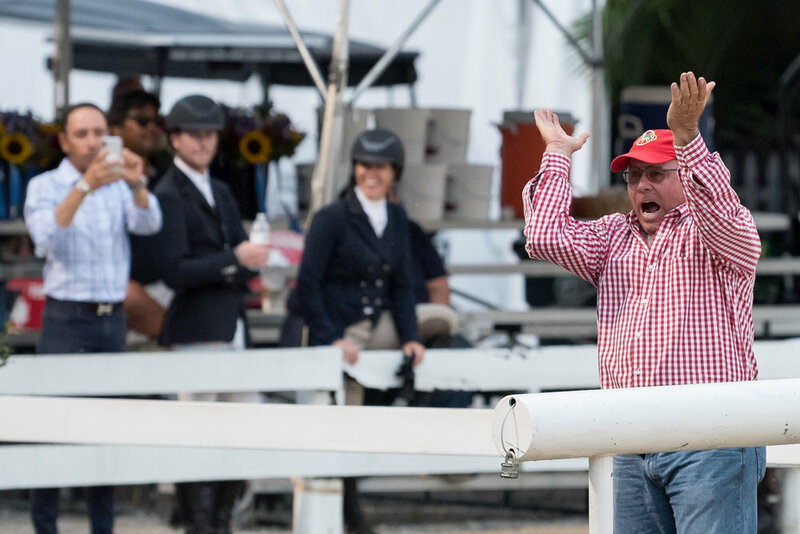 Towell, of Wellington, Florida, was one of the expert show jumping athletes chosen to help educate the clinic attendees and lead a team through the culminating Nations Cup-style competition. After three days of mounted and unmounted instruction from top clinicians, covering a variety topics including stable management, horse health, breeding, press relations, flatwork and gymnastics, the clinic culminated with seven teams competing. Earning the victory was the team of Sydney Stephenson, Cameron Tague and Cathleen Driscoll, led by Chef d'Equipe Hardin Towell. Driscoll, from Elk Mills, Maryland, received her spot in the clinic after winning the 2018 USHJA Emerging Athletes Program National Training Session. "[This sport is] not just about showing up every day and riding your horse; you have to want it. You have to want it more than anything else, and you have to be willing to sacrifice your time and money and put everything you have into this," she noted. "It really needs to be a whole-hearted passion." The USHJA Emerging Jumper Rider Gold Star Clinics are part of the USHJA Emerging Jumper Rider Program, launched in 2017 in conjunction with the USHJA Zone Jumper Team Championships. Tague, of Cream Ridge, New Jersey, clearly sees the benefits. "I'm already planning my show schedule leading up to the championships next year, so I can try to make it again,” she said. "The opportunity is just incredible. The amount of information we're getting is unparalleled to any other program this sport offers right now." Each team consisted of three riders: one at 1.10m/1.15m, one at the 1.20m/1.25m and one at 1.30m/1.35m. One minor adjustment to the format was that all riders rode a full course in Round 1 and then an abridged jump-off course in Round 2, again allowing them another opportunity to put their knowledge to work. Continuing the invaluable experience, lead clinician Richard Spooner provided feedback and commentary following each rider's course. "It's an absolute necessity for these young riders to have this opportunity," said Spooner, 47, who was a star in the equitation as a junior rider, and has generated his own successful show jumping career via years of hard work, and plenty of watching and learning. "It's a program I wish I had when I was younger," he continued. Throughout the packed four days of mounted and unmounted instruction, riders learned from Spooner, Olympian Anne Kursinski, and their Chefs d'Equipe in the ring. They also participated in in-depth educational sessions outside of the ring, including horse care, stable management, course design and a highly informative roundtable discussion with show jumpers Lillie Keenan, Anne Kursinski, DiAnn Langer, Richard Spooner, Hardin Towell and veterinarian Geoff Vernon. The USHJA Emerging Jumper Rider Program serves as the entry point for the Show Jumping Athlete Pathway, a joint USHJA-USEF effort that identifies and nurtures Jumping athletes as they advance through the sport to enhance future success for Olympic and international teams representing the United States. For more information about Hardin Towell and his availability for clinics and coaching, please click here. Special thanks to the USHJA for the press release. Posted on December 31, 2018 by Tricia Booker. The Finally Farm team enjoyed a bountiful show during the Holiday Premiere, held at Bruce’ Field in Aiken from November 30-December 2 just after Thanksgiving. One of several highlights was Libbie Gordon’s victory in the $2,500 USHJA National Hunter Derby aboard Tybee in their debut together. Gordon is leasing the fancy chestnut derby veteran for the new show season, and they started out with a bang, also earning the reserve championship in the 3’6” Junior Hunters. On the flip side, Maggie Hill and Charmeur ended their partnership during the class when placing second to Libbie. Maggie’s lease ended, and the lovely bay goes back to Missy Clark and North Run. Finally Farm now welcomes Eclipse to the barn for the upcoming show season as Maggie’s equitation partner. “Charmeur has been a great horse for Maggie, and we thank North Run for a wonderful year with Charm. We are looking forward to an exciting future on Eclipse,” said Liza. In total, Finally Farm riders collected seven championships and two reserve championships at Aiken. In the High Children’s Jumpers, it was Gigi Manigault and Cassiana who dominated. The pair won two classes on the way to the championship. Elle Boyd made her first appearance with the Small Pony Hunter Blue Moon a winning one. Ruby Sloan was back with Libertina in the Low Children’s/Adult Jumpers after a break. “We’re glad to have them back in the barn. They had a nice first show back with excellent ribbons, and we’re looking forward to a successful WEF!” said Liza. Posted on December 12, 2018 by Tricia Booker. In addition to Liza Boyd’s thrilling win in the WCHR Pro Finals for the second consecutive year (see Liza Boyd Repeats $10,000 WCHR Pro Finals Victory published in the News October 6), the Finally Farm team had a banner show at the Showplace Arena in Upper Marlboro, Maryland. 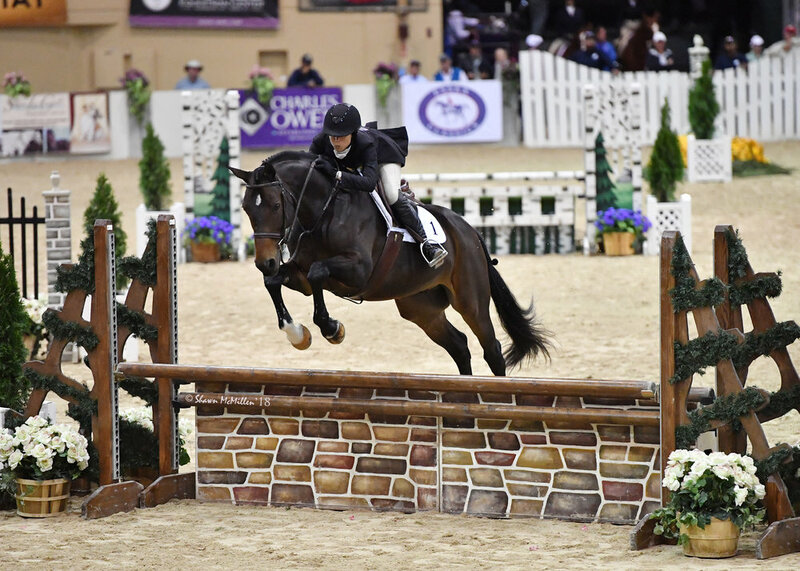 Maggie Hill started the momentum during Equitation Weekend when she captured the Equitation 15-Year-Old championship aboard Charmeur. Maggie also placed fifth in the THIS Medal Final in a competitive field. Liza especially liked the format of the USHJA Jumping Seat Medal, which is based on the USEF Talent Search. Riders contest flat, gymnastics and jumping phases. In the Hunters, Maggie also showed her prowess. She earned the Small Junior, 15 and under, championship aboard O’Ryan and received top ribbons aboard Cassanto. Thanks to Cassanto’s beautiful shine and condition, our own Alberto Ramirez received the Shapley’s Award. 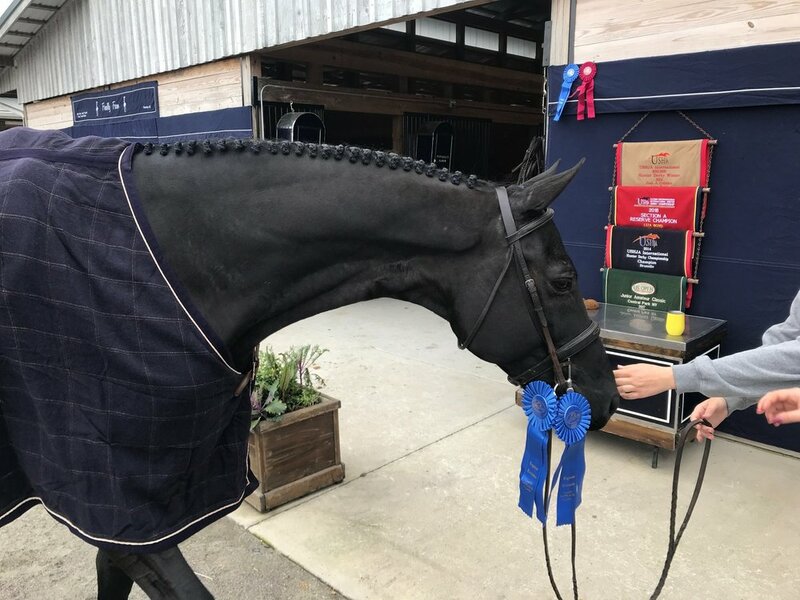 Liza was especially grateful to see 16-year-old O’Ryan continue his winning ways, showing brilliance and freshness in the ring on the way to championship honors. Maggie was also third overall in the WCHR National Junior standings and won the WCHR Southeast Regional title. WCHR. Libbie Gordon and Shamrock earned great ribbons in the 3’6” Large Junior Hunters during their first Capital Challenge together. They earned a second in the handy and sixth in the WCHR Challenge. Sister Abbie Gordon also got some ribbons on Show Me Love out of 41 Medium Pony Hunters and had great rounds aboard her new Large Pony, Nominee. Gigi Manigualt and Bastille took home ribbons from the 3’3” Juniors Hunters in a competitive field during her first Capital Challenge. Liz Devor and her own Sawyer earned fantastic ribbons at Capital Challenge in the Adult Amateurs, including fifth in the WCHR Adult Amateur Challenge. Elle Boyd made her debut at indoors in the Small Pony Hunters aboard Hershey’s Kiss. Posted on October 13, 2018 by Tricia Booker. Professional hunter competition wrapped up Friday, October 5, at the Capital Challenge Horse Show with the heralded $10,000 World Championship Hunter Rider (WCHR) Professional Finals. 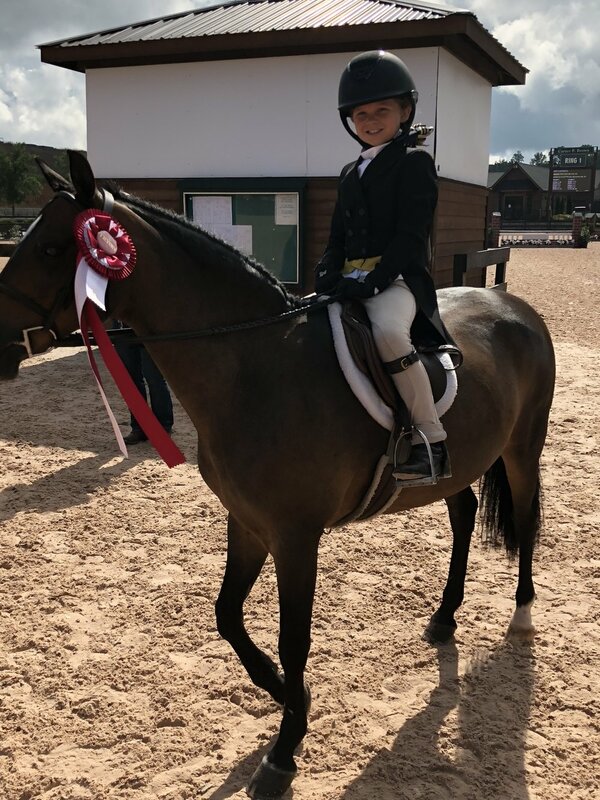 In her sixth time in the class and marking her third win, Liza Boyd, of Camden, South Carolina, came out in first in the three-phase class that puts top hunter professionals in a head-to-head competition to earn the title World Champion Hunter Rider. Friday evening kicked off with the Round 2 of the Playoffs in which the six riders competed over a handy course on a horse of their choosing. Boyd, Stewart, Steege and Colvin earned the top scores after Rounds 1 and 2 to continue on to the Final Four, where they all rode each of the four evenly matched horses that were donated by Claiborne Bishop/The Barracks and University of Virginia in Charlottesville, Virginia. She went first in the final four rounds, riding Falcon, who ended up being the highest-scoring horse with scores of 92.33, 90, 91.33 and 93.5 with Boyd, Steege, Colvin, and Stewart respectively, and the recipient of the Far West Farm Perpetual Trophy. Approximately 5 points behind Boyd was 19-time competitor Scott Stewart who is no stranger to the title World Championship Hunter Rider, having earned it six times previously. Having participated so many times, Stewart appreciated the change in format for 2018. Press release courtesy of the USHJA. Posted on October 6, 2018 by Tricia Booker. The Aiken Fall Festival Horse Shows, held at Bruce's Field in Aiken, South Carolina, proved to a show to remember. In addition to garnering many championships and blue ribbons, success also came in new sections and competition. 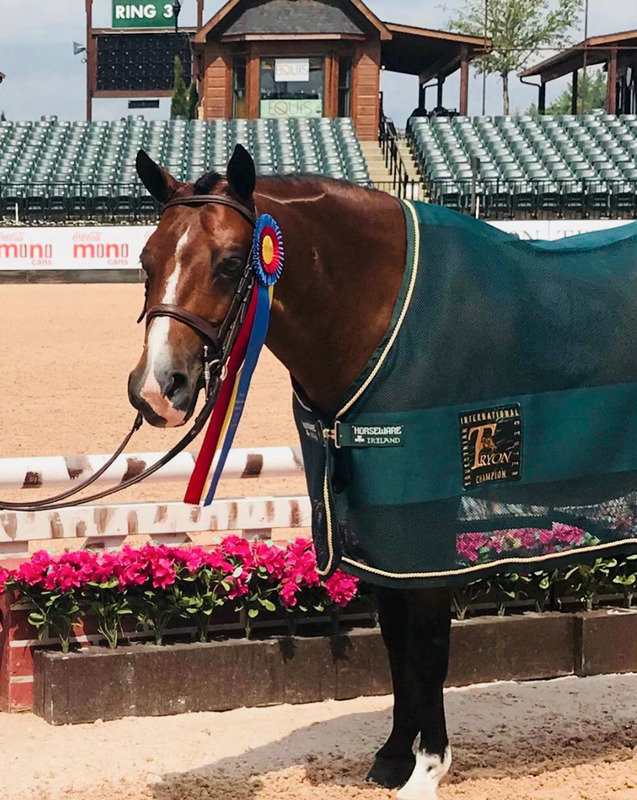 Junior rider Maggie Hill took on the professionals in the $15,000 William Howard Memorial National Hunter Derby and made her presence known with the second-placed ribbon aboard Charmeur. Only Hunt Tosh could top Hill's score, and Maggie even topped her own trainer, Liza Boyd, who placed fifth riding Kelly Maloney's Justified. "This was such a great class," said Liza. "Maggie went in there and rode great. She beat me and Hunt, on his other horse, and professionals Tim Maddrix and Daniel Geitner. It was super fun to watch her and cheer her on." For Liza, the pink ribbon was especially meaningful because it was Justified's first Hunter Derby after many years spent in the Jumper ring. At Aiken, Justified earned top prizes in the Performance Working Hunters before her derby debut. Maggie also impressed the judges in the equitation ring, winning the WIHS Overall, Jumper and Hunter Phase, the ASPCA Maclay and the Dover Saddlery/USEF Hunter Seat Medal classes aboard For Side VDL. 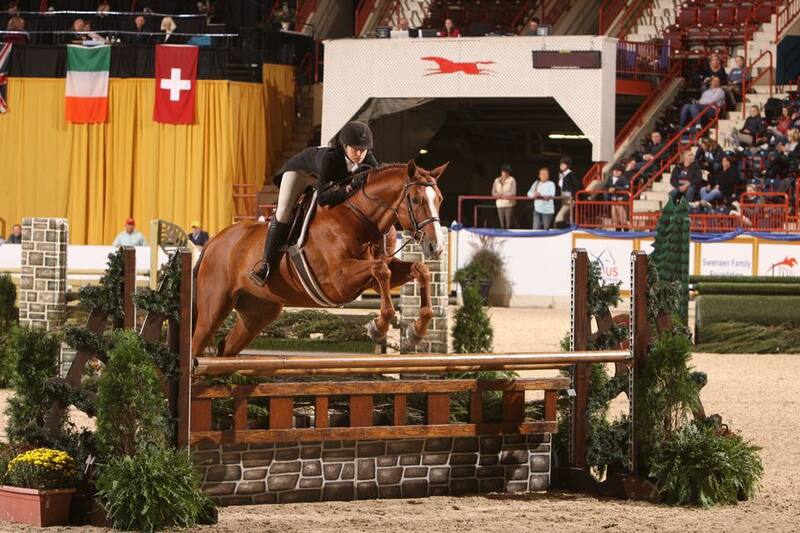 She and Cassanto also topped the Junior Hunter Classic. Elly Ficca and Cleopatra’s Smile won three of the four over fences classes to capture the 3’6” Junior Hunter championship, while Sawyer and Liz Devor captured the Adult Amateur, 18-35, championship. Erin McGuire and Kasarr continued on collecting impressive accolades this year, winning the $5,000 Aiken Saddlery Welcome Stake. Reserve championship honors went to Gigi Manigault with Bastille in the 3’3” Juniors, Maggie with Cassanto and Tradition in the 3’6” Junior Hunters and McKenzie Miller with Otis Spunkmeyer in the Opportunity Crossrails. Posted on September 20, 2018 by Tricia Booker. The Finally Farm team, family and friends enjoyed their annual trek to the Blowing Rock Horse Show in North Carolina in July, where in addition to enjoying this traditional and unique show, they also spent quality time together outside the ring. “This show is always a highlight of our summer. It’s such a special horse show,” said trainer Liza Boyd. “It’s just two rings, which is nice. I’m not running from ring to ring. Yes, the days are long, but we have time between classes, and it has an old-fashioned feel and it’s a great change of pace. Liza’s time at Blowing Rock was also rewarding, as she guided Clemens to multiple honors, including victory in the USHJA International Hunter Derby during Week 2, to win the Diane Ward Memorial Trophy, and to championship honors in the 3’9” Green Hunters during Week 1. “Clemens had two great weeks. The first week he got 88s and above in every class and was second in the Challenge of Champions. Then, we did the High Performance Week 2 to jump a little higher, and he was fantastic,” she said. In the first round of the International Hunter Derby, Liza said Clemens was a bit playful, putting him third going into the Handy Round. When Liza returned for the second round, she planned to go for the win. Liza always uses Blowing Rock’s Derby as a preparation for Kentucky in August since the derby also runs as an evening/night class and has atmosphere. In addition, this year Liza’s husband Blake, her brother Ned and friend Jim Breedlove offered a free fish fry in memory of Pauline Russell. Liza was also proud of the Finally Farm juniors who also tackled the International Derby, with Libbie Gordon riding Shamrock to seventh in their first International Derby together, and Maggie Hill and Charmeur placing ninth and Elly Ficca and Cleopatra’s Smile taking 11th. Maggie and Elly will also compete in the USHJA International Hunter Derby Championship in Kentucky after having a wonderful Blowing Rock experience. 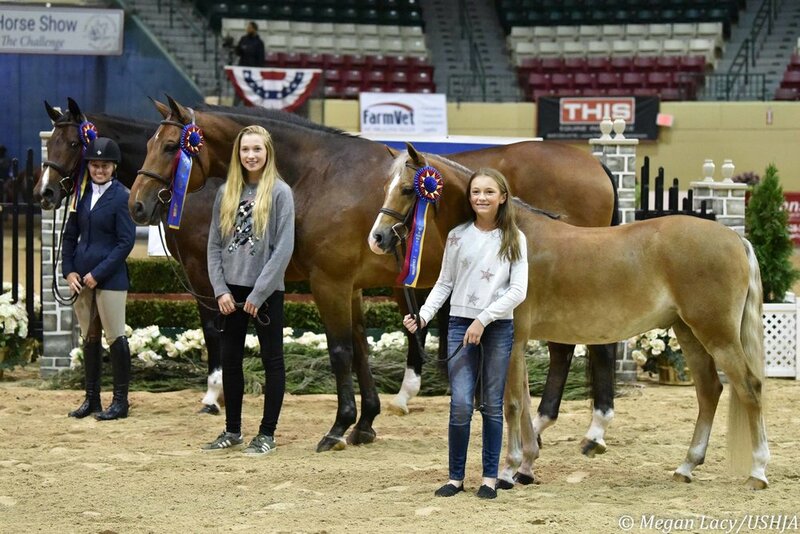 Maggie received the Joan Ellis Goodwin Memorial Trophy and the Bill Daily Perpetual Memorial Trophy for Best Child Rider on a Horse during Weeks 1 and 2, while Elly received the Joan Ellis Goodwin Memorial Trophy Best Child Hunter Rider Week 2. Maggie and Cassanto received the Lyrik Trophy for Overall Grand Champion Junior Hunter and the Cassalo Trophy for Grand Champion Large Junior Hunter, while Elly and Cleopatra’s Smile receive the Elizabeth Crockett Luczak Trophy Grand Champion Small Junior Hunter. Libbie was also reserve champion in the Junior Hunters the first week with Shamrock and third in the Junior Hunter Classic. “They all had a great two weeks of showing with their hunters, and I was thrilled how everyone rode,” said Liza. Maggie also continued getting to know her jumper Hope in Children’s Jumpers with top placings and earned excellent ribbons in the equitation with For Side VDL, including victory in the Dover Saddlery/USEF Hunter Seat Medal, the WIHS Overall, Hunter and Jumper phases and the THIS National Children’s Medal. Libbie was consistent both weeks with Shamrock and also competed in the Low Children’s Jumpers, where she earned great ribbons with Can Do. Liza was also proud of her 3’3” Junior riders, including Gigi Manigault who earned great ribbons on Bastille as well as Cassiana, the jumper she’s leasing from Stella Styslinger. In the ponies, Abbie Gordon continued her tricolor run. She was reserve champion on her Medium Show Me Love the first week and then catch rode Robin Greenwood’s Nominee to the Large Pony Hunter championship the second week. “She’d never done the larges, so that was wonderful. She’s come a long way,” said Liza. Mackenzie Miller leased Elle’s Otis Spunkmeyer and showed in Walk-Trot-Canter, where she earned the reserve championship. Mackenzie’s mother Paige Miller guided Lavasco to ribbons in the Adult Amateurs, so it was a great two weeks for the mother-daughter duo. “I’m proud of Mackenzie and happy that Otis is able to teach another young rider the ropes,” said Liza. In the Large Ponies, Clara Saad rode Fox Creek’s Cavalier to excellent ribbons in preparation for the USEF Pony Finals. “We wish her good luck there!” added Liza. In the Adult Amateur Hunters, Finally Farm collected many ribbons. Alison Thorpe showed Kelly Maloney’s Justified and Liz Fogleman competed her own Sawyer. In addition, Kelly guided Fieona to solid performances and ribbons in the Low Children’s/Adult Jumpers, while Sarah Isgett jumped to double clears in the same section with Killarney. After taking a break, Zola Thompson returned to Finally Farm and showed the first week aboard Fonteyn HS in the Low Children’s Hunters, where the picked up some great ribbons. “It was fun to have her back in the barn!” said Liza. Posted on August 8, 2018 by Tricia Booker. 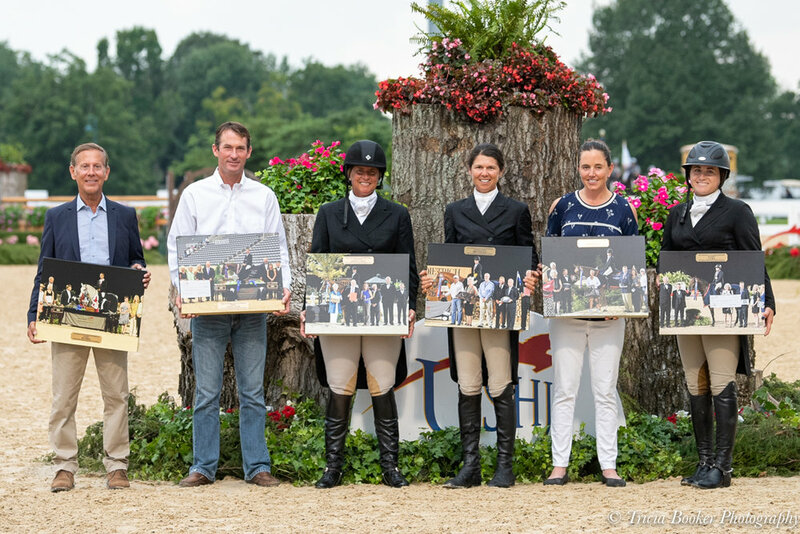 Elle Boyd and her uncle, Hardin Towell, both made the Finally Farm family especially proud during the Tryon Summer III, held June 27-July 1 in Mill Spring, North Carolina. Elle guided Hershey’s Kiss to second-placed honors in the USHJA Pony Hunter Derby, while Hardin piloted Ann Thompson’s Carlo to the red ribbon in the $70,000 Adequan Grand Prix CSI 2*. Both classes were featured events held at the Tryon International Equestrian Center. Thirty-eight horse-and-rider pairs tested the Ken Krome-designed grand prix track on Saturday night, with seven pairs returning to prove themselves over the short course. Hardin and the 12-year-old, Holsteiner gelding (Casall x Landlord) claimed second place honors, stopping the jump-off timers in 38.60 seconds, just behind Sydney Shulman riding Ardente Printaniere. After cheering on her uncle Saturday night, Elle returned to the ring aboard the Small Pony Hershey’s Kiss on Sunday for a stellar performance in the Pony Derby. This was her derby debut and the first time she donned a shadbelly. Liza said Elle also had fun showing in the George H. Morris Stadium on Saturday, the first time she’d ridden in Tryon’s “big ring.” In the derby, Elle was second to Maddie Tosh, the daughter of professional rider Hunt Tosh. “It made me laugh to stand at the ring with Hunt. Over the years, we’ve competed against one another and been first and second so many times, and now our kids are coming along and doing the same thing! Hunt and I were standing at the in-gate and taking the photos now. It was so great!” said Liza laughing. 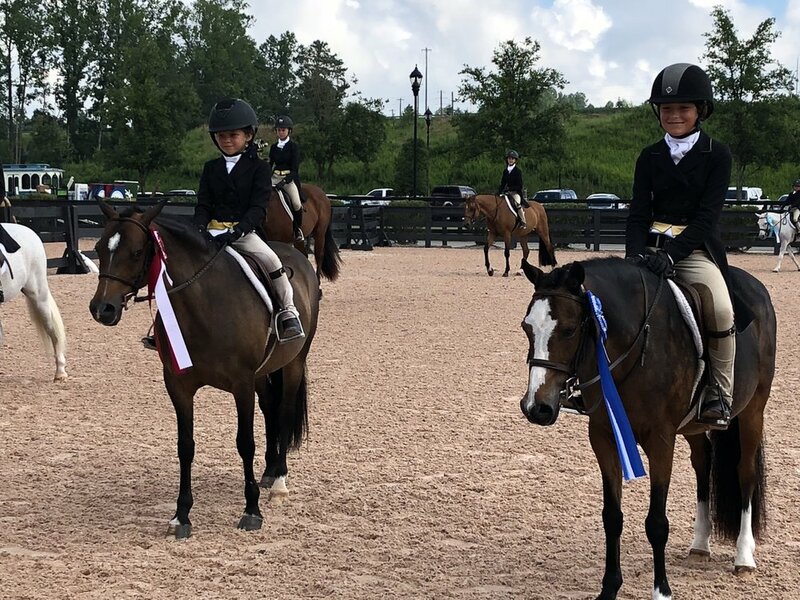 Sisters Abbie and Libbie Gordon continued the family theme, earning tricolor honors at Tryon. Abbie guided Show Me Love to the Medium Pony Hunter championship, while Libbie collected the 3’6” Junior Hunter reserve championship and won the Junior Hunter Classic aboard Shamrock. In the jumpers, Kelly Maloney and Fieona earned excellent ribbons in the 1.15m Non-Pro section, as did Maggie Hill riding Hope. University of South Carolina student Sarah Isgett returned to train with Finally Farm and enjoyed excellent performances with Killarney in the Low Adult Jumpers. Sarah Livingston and Ne-Yo earned excellent ribbons in the 3’3” Junior Hunters, as did Gigi Manigault riding Bastille. Gigi also continued to develop her new partnership with Cassiana during Tryon and had nice rounds in the Low Children’s Jumpers, while Libbie Gordon took the reins on Hardin’s Can Do, learning the jumpers and having fun. In the Adult Amateur Hunters, Joann Loheac’s Chestnut Avenue jumped to championship honors in the 50 and over section with Lisa Baugh. The pair won three of the four over fences classes for an impressive point total and also topped the WIHS/NAL Adult Hunter, 36 and over, Classic. “We were excited to have him back and to help Lisa. She’s always fun to work with,” said Liza. Lavasco and Paige Miller also took home great ribbons in the Adult Amateur Hunters, with consistent performances in the 36-49 section. Posted on July 2, 2018 by Tricia Booker.